Though your spa is new it is still important to clean it first. New spas are "wet tested" at the factory to make sure that everything works correctly, and to guarantee no leaks. Following the "wet test" the spa is drained and wrapped in protective plastic. Eventually your spa is shipped to the dealer or directly to you. Because these spas have been wet, algae and mold may begin to grow inside the plumbing and filter in the dark, moist environment. The same is true for the seldom-used garden hose that you will be using to fill your new spa. The first time you fill your new spa, or anytime the spa has been drained and left empty for more than three weeks health officials recommend flushing the spa thoroughly with an 80ppm chlorine solution, or soaking with a 20ppm solution for nine hours or longer. In addition, you should soak the filter for 90 minutes or longer in a solution of 1 part household bleach to 7 parts water. When you get a new spa, you will want to use it quite often, and of course you want the water to stay crystal clear. But new spas may have manufacturing residues of silicon, Teflon, waxes and other chemicals that slowly wash out and cause cloudy water for many months. Chlorine will bleach these residues, keeping the water clear during this time. 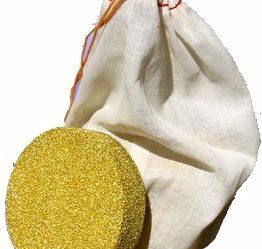 And so, for new spa owners we suggest the use of dichlor, (not bromine), per the chlorine manufacturer's recommendations for the first 30 days. Then Crystal Clean and drain. If you do not want to soak in highly chlorinated water, then fill your spa and add Natural Spa according to label instructions. You may notice a slight haze for awhile as the manufacturing residues wash off into the water. We recommend you 'shock' occasionally with non-chlorine shock, hydrogen peroxide, or chlorine, then Crystal Clean after four to six weeks of use. It's your choice. Complete instructions are in our starter kits. 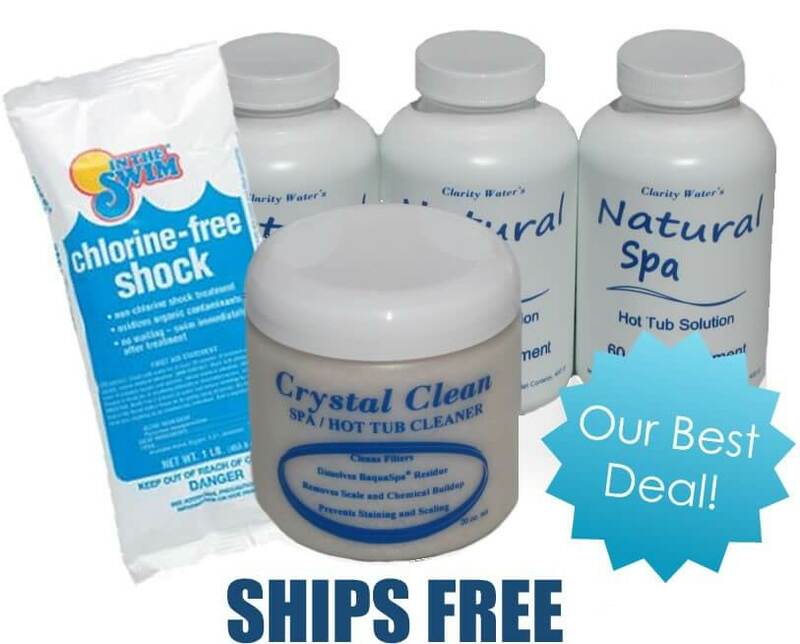 Start up or re-start your hot tub the clean and easy way with our Natural Spa Start Up Kit. 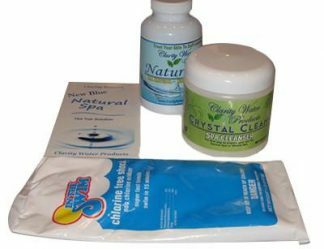 This kit contains one bottle of our all natural highly effective spa cleaner, "Crystal Clean," three bottles of Natural Spa (up to 6 months of treatment) and a FREE bag of non-chlorine shock. IF YOU NOW USE BIGUANIDE (BaquaSpa). Drain your spa and refill with fresh water to eliminate the Biguanide in the water. Crystal Clean the spa and soak the filter in a concentrated solution of Crystal Clean. Add Natural Spa to the fresh water. You may need to 'shock' the water with non-chlorine shock, or hydrogen peroxide in the next few weeks to maintain clarity. IF YOU NOW USE CHLORINE OR BROMINE. Take out the filter and toss the bromine floater, if used. Rinse or replace your filter so that the water treated with Crystal Clean will clean it thoroughly. 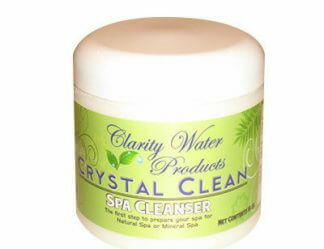 Turn on all the jets and slowly add Crystal Clean to the skimmer area of your spa. The longer you circulate the water, the better the cleaning job. The contaminants that are in your spa will cause the water to get cloudy and may cause foam and scum to rise to the surface. Scoop away this foam while purging, and dispose of it. 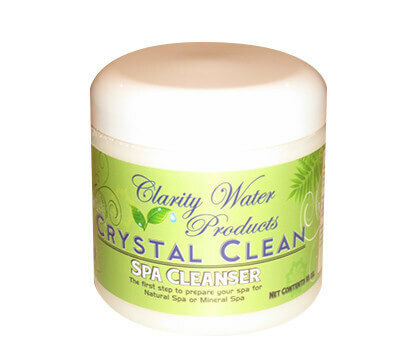 Crystal Clean your spa for 2 - 6 days, until thoroughly clean. Drain your spa and fill with fresh water. 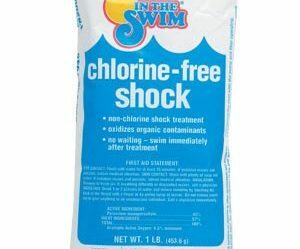 Shock the new water with 15ppm of chlorine. This should remove any residual chloramines, tannins or algae. You may use your spa as soon as it is hot enough, though the chlorine level will still be quite high. If your water is high in iron, copper, calcium or other scale causing metals: Add 1 to 2 ounces of Crystal Clean to every 100 gallons of water on the third day, to sequester these metals and prevent any problems with staining or scaling. Heat the water to at least 80° F, and wait until the chlorine level is below 2ppm before adding Natural Spa. You will notice that Natural Spa is a thick liquid, and does not immediately dissolve into the water. Take out the filter and circulate with the air off for 15 minutes or more to mix the Natural Spa into the water, but don't put the filter back in for 4 hours. This gives the Natural Spa time to fully dissolve into the new water, rather than getting stuck in the filter. 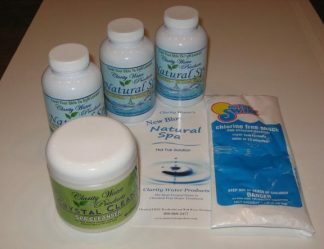 One bottle of Natural Spa will keep your water looking and feeling great for one to two months with average use. Average use is considered using your spa 3 to 5 days a week for twenty minutes each time. With more use by more people or for longer times you will have to add a bottle more often. If you use your spa daily, you will add a bottle every 4 to 5 weeks. If you don't use your spa for long periods of time, you may find that the water stays nice and clear for 3 to 4 months. When you haven’t used your spa for a long time, you need to add a new bottle of Natural Spa before use to recondition the water. The final consideration is the size of your spa. One bottle of Natural Spa will treat up to 500 gallons, so larger spas will need to start with two bottles or more. 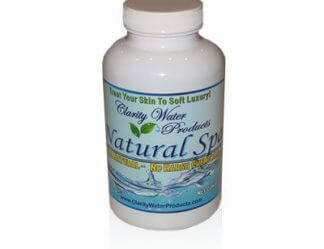 Large swim spas will need a bottle of Natural Spa added every one to two months even when not used a lot. Smaller spas (under 200 gal.) 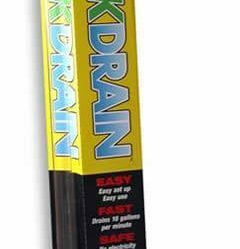 can be a bit more difficult to maintain, especially under heavy use. Best results come from adding one full bottle after filling with fresh water, then adding another ½ bottle every three to four weeks, and depending upon use. Also, small spas should be drained more often. And remember to remove (and clean) the filter whenever you are adding a bottle. 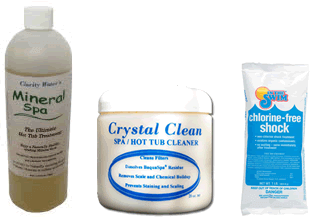 No testing is required, as Natural Spa has no effect on pH or alkalinity. And there is no need to drain the water as long as it stays clear and fresh, which can be up to a year. We do recommend that you drain every 6 months, (just because), and use Crystal Clean just before you drain, to keep your spa as clean as can be. A clean spa uses less energy to heat the water, runs smoother and lasts longer. Circulate twice daily on high, with lots of air induction for 15 minutes to an hour. Longer running times reduce the product life. 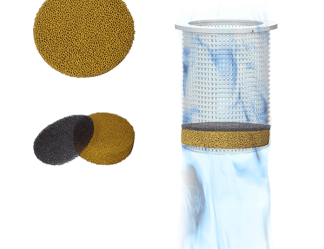 Clean filter with high-pressure nozzle when adding a bottle of Natural Spa. If you clean the filter too often you are washing away the Natural Spa and leaving your spa water unconditioned. Once a year, or as needed soak the filter(s) in a bucket of water with 1/2oz Crystal Clean per gallon of water. 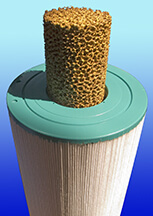 Do not use other filter cleaners as most will cause extensive foaming for several days. Check pH and balance if necessary. Your pH can be between 6.8 and 8.4. Most city water has had the pH and alkalinity properly balanced before distribution. The Natural Spa can tolerate a much greater pH range and still maintain water quality. A higher pH is healthier for your skin. You can raise the pH by adding baking soda to your spa, 1 ounce at a time. To lower the pH use Crystal Clean. DO NOT add more than 8 ounces at a time - you want to lower the pH slowly. Wait at least 4 hours after adding any chemical before testing to see what effect it has had on the water. Spas of 200 gallons or less should add one full bottle of Natural Spa to fresh water, then replenish with ½ bottle every 3 to four weeks, depending on use. Add Crystal Clean 6 days before draining to keep the spa nice and clean. Soak filter in bucket of water with ½ oz Crystal Clean per gallon of water. With the Natural Spa there is no build-up of toxic, corrosive chemicals in your water to worry about, so water changes are needed much less often than the one to four months required with other systems. Alkalinity: Alkalinity can be anywhere between 60 and 280. Raise alkalinity with baking soda or Alkalinity Increaser, lower with Muriatic Acid or Easy Acid, available at a pool supply. Metal Gon® : Not needed. If your local water is very high in dissolved metals, add 1 to 3 ounces of Crystal Clean to every 100 gallons of new water to sequester these metals and prevent any problems with staining or scaling. Defender® : Because you’re not adding tablets or granules to your water, you normally will not need this product. If sandy crystals begin to form, use Crystal Clean to cure and prevent the problem, according to our instructions. Foam: Do not use 'Foam Down' type products. Lingering clumps of foam mean it's time to add another bottle of Natural Spa. If the foam is excessive, scoop it off and dispose of it to eliminate the cause of the foam. If it doesn't go away in a day or two, then Crystal Clean and drain the spa. Clarifiers: Do not use a clarifier, as the Natural Spa is a clarifier itself. Other clarifiers may cause foam and some may even bond with the Natural Spa and cause it to be filtered out of your water. 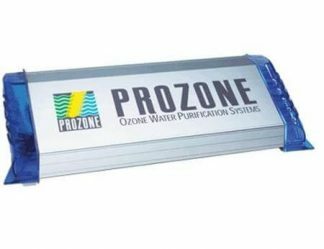 Ozone, non-chlorine shock and hydrogen peroxide: You should use these oxidizers under heavy use conditions. These are excellent products that help clear the water, though constant shocking will shorten the effective life of the Natural Spa. one bottle of Crystal Clean and a FREE bag of non-chlorine shock.